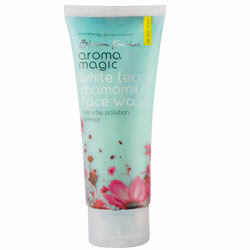 Aroma Magic White Tea & Chamomile Face Wash Prevent ageing & protect skin from free radicals, removes dirt & makeup, pollution defence. Deep clean your pores with white tea and soy milk extracts & exfoliating micro beads. Prevent ageing & protect skin from free radicals. Chamomile essential oil soothes & calms, leaving you fresh & relaxed. Removes dirt and makeup amazingly. Paraben free and Natural face wash. Apply to moist face & neck. Massage & rinse off properly. Use every morning and night, moisturise and use sun protection for best results.